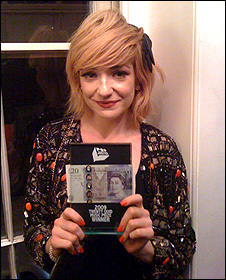 Girls Aloud singer Nicola Roberts turned up at a pub in central London to accept a tongue-in-cheek alternative to the Mercury Prize on Tuesday night. The 23-year-old was presented with a solitary £20 note after her band's hit The Promise was named single of the year by music website Popjustice. "How do I feel? I feel so liberated," she joked as she posed for photographs. At the same event, the Sugababes were awarded worst single of the year for Girls. They will receive a £20 invoice. The Popjustice Twenty Quid Music Prize was established as a light-hearted antidote to the more serious Mercury Prize - where the winner receives £20,000. "The voting process is sort of a shambles," said Popjustice editor and chairman of the 35-strong jury, Peter Robinson. "I draw up a shortlist of 12 songs and then, over the course of the evening in a pub with a lot of alcohol, a group of judges who have applied through the website eliminate one song at a time." Girls Aloud have won the prize five times in the last seven years. Roberts arrived for the ceremony during a particularly heated argument over whether her song or Tinchy Stryder's Take Me Back should remain in the running. She later nominated Girls Aloud's own The Loving Kind for worst single of the year. "It was so interesting to hear people thrash out opinions on all the other bands and other songs - as daunting as it was," she told the BBC News website. "But the best song won in the end." However, the Liverpudlian singer expressed dismay that the £20 note came "in a little plastic container". "You can't actually spend the money, but it's there on your shelf," she laughed.